A Year Between Friends: Crafts, recipes and best of all….friendship. A Year Between Friends: 3191 Miles Apart is a lovely book filled with craft ideas, recipes, letters and best of all – friendship. Molly Wizenberg wrote the forward and it’s a great beginning. She explained how she discovered a blog called Port2Port where Maria (MAV) was an author. This was over 10 years ago. Molly and Maria were fans of Stephanie Congdon (SCB) on Flickr. The ladies began collaborating with photo projects and craft ideas. They have been corresponding for quite some time and the result was deep friendship between Maria and Stephanie. This book is divided by the months of the year. They each take photos of their respective locales – Maria who goes by MAV is in Portland Maine and Stephanie (SCB) lives in Portland Oregon. In addition to photos there are recipes and letters. What a lovely display of friendship this book is. From Amazon: Maria Alexandra Vettese and Stephanie Congdon Barnes share a love of art and design, handmade pleasures, and a well-lived domestic life. Almost a decade ago, they began their first year-long project together, posting a photo from each of their mornings on their blog, 3191 Miles Apart, named for the distance between their homes in Portland, Maine, and Portland, Oregon. The inspired recipe from this book is soup. But we haven’t been eating much meat lately and so, while I planned on chicken soup….I diverted to a veggie chili. Very different but one of the biggest components in this book features healthy eating. I made a black bean chili with finely chopped zucchini, green onions,tomatoes, mushrooms and a little bit of water. Once everything started thickening up I added about 3/4 cup of brown rice. The plus of our healthier eating (and additional walking) is the weight loss. My husband has lost 22 pounds while I have lost 12 pounds. Yes, I keep up with him eating and drinking yet my weight loss has been considerably slower. 🙂 Oh well! Good book with great recipes and craft ideas. You will love flipping through it. Linking up with Deb at Kahakai Kitchen for her Souper Sunday series. The linkup for this week may be found HERE. 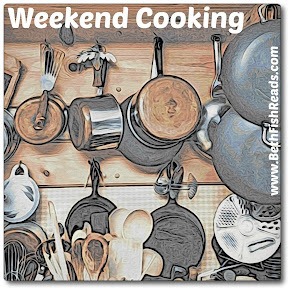 Also linking with Beth Fish Reads for her Weekend Cooking Series. This sounds like a book I’d enjoy! I’ll check to see if my library system will has it. I have a friend who I met in the mid 70’s who is more like a sister than just a friend. She lives in Ohio still but when we see each other it’s like we just saw each other the day before. Vicki, You would definitely love this book! This sounds like a great read and I loved Molly’s first book. Debra, I liked the first book much better than Molly’s second one. I think women lose weight slower than men which is not cool! 12 pounds is nothing to sneeze at though. Great job! This book sounds awesome! I love the back and forth nature of it and it looks like one I’d really enjoy flipping through. I go to my copy from the library so yours may also have it, Katherine. It’s lovely and I think would make a goood gift. Nothing like black bean chili, is there? This sounds like a fantastic book. I love everything about it. I’m going to have to track down my own copy. Good job on the weight loss. It’s always the same with us too — it melts off Mr. BFR but not me. Sigh. BFR, I think guys always lose it quicker than us ladies. Oh well, I am just happy getting into smaller sizes! I loved this book. It’s always a pleasure participating in Souper Sunday. Souls are my favorites for lunches, especially at work.